In the mean time, I realized I wanted to make my tools more identifiable so I could loan them out when camping and such and hopefully get them back. I thought it would be an excellent addition to make them glow so I could find them should I be working at night and misplace one. Then I found that Plasti Dip comes in a clear variety (for adding your own color as available in a kit, but you can buy just the clear). 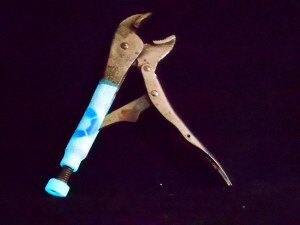 So then the solution was pretty obvious: make a color scheme/stencil to spot my tools easily, add a label with my name, and dip it in (mostly) transparent Plasti Dip embedded with glow-in-the-dark powder (1-2 ounces-weight [25-50 grams] per 10 fluid ounces 1 of Plasti Dip). If you want the step-by-step instructions, check out the Instructable.